Halong Bay was formed by millions of years of geological changes, which created thousands of islands. While you are planning to go to Halong Bay, why don’t you pay a short stay at some nearby destinations? You will have an unforgettable trip in Vietnam – we promise! Sapa is considered the tourist capital of mountainous north area of Vietnam, it is also known as “the Tonkinese Alps” because of its location 1500 meters (4921 feet) above sea level and on the western edge of a high plateau. The special location of Sapa makes it the only place in Vietnam has snow in winter time. Sapa is famous for both its breathtaking, dramatic scenery and its rich cultural diversity. Coming to Sapa, you should do some trekking to Ta Van, Cat Cat and learn about the life of ethnic people. The local market is another highlight that you shouldn’t miss, especially love market, which is held on every weekend. The local folks love talking with tourists and unlike other parts of Vietnam, English is used widely in Sapa. The cable car is available now in Sapa to Fansipan mountain, but the traditional trekking route is still one of the challenges for adventure lovers. Besides, O Quy Ho Pass should be written down on your list, it is one of the most spectacular passes and to be the most photographed pass of Vietnam. Activities: Trekking, visiting the local market, homestay, visiting H’mong, Dzao village. Mai Chau is a nearby village and is a perfect place for short relaxing and experiencing Vietnam’s village life in a remote setting. Mai Chau is not a good place for trekking but it pleased you with emerald mountains and green terraces. The best time for visiting Mai Chau is in Spring, from February to May, during that time, the plum flowers bloom brightly and strawberries are ready for you to harvest. Activities: Trekking, homestay, biking and visiting Dzao village. Yen Duc is a lovely village hidden among green paddy field. While the rice field is not a unique feature of the village, Yen Duc is remembered because of the friendly local. You can feel the warm welcoming as soon as you arrive. The meaning of visiting this village is to get your hands on daily tasks of local people. You will have chances to do some fishing with bamboo baskets, join in rice making process, broom making, and cooking class. Your experience will not be fulfilled without “puppet water show” – a traditional and unique form of art which is still fascinated and performed in Vietnam. The show in Yen Duc was performed by local farmers after their day word, and it tells stories, folk tales and legends related to daily life activities: the celebration of the rice harvest, dragon and phoenix dancing, and much more. Activities: Biking, visiting local markets, fishing with bamboo baskets, watching water puppet show and etc. Ninh Binh is a lovely destination which is blessed with magnificent landscapes. The city of Ninh Binh may offer little to no interest to the international tourist, but surrounding area has plenty of options for travelers who want to spend a few days discovering the wealth of natural attractions without being annoyed by crowds. The Tam Coc – Bich Dong is known as inland Halong Bay, while Trang An is recognized as a UNESCO World Heritage Site. Coming to Ninh Binh, you cannot miss Trang An area, just less than 10 km from the city center, this distance is extremely suitable for biking. One interesting figure is that Trang An is home to about 577 plant species including 10 species listed in the Red Book of Vietnam. Hanoi – the heart of Vietnam, through the history of Vietnam, this city has changed, suffered and been rebuilt. But still there is some things old, some things that you only feel while staying in Hanoi. Hanoi is a charming city mixing of old and new Vietnam culture, of Oriental and French colonial architecture styles. The age-old area – Old Quarter is embraced by skyscrapers of business districts, the French colonial buildings stand next to Buddhist pagodas. The Old Quarter is the ancient commercial streets of Hanoi, each street named after original business hundreds of ears ago. Many tourist-favorite attractions are within walking distance from Hanoi Old Quarter: Hoan Kiem Lake, Water Puppet Theater, Temple of Literature, Ho Chi Minh’s Mausoleum, Museums and so on. Walking around street can be exhausted sometimes, cyclos are available on every street corner, and they will take you for a city tour or from one attraction to another attraction. Some of the cyclo drivers can speak English, they love to tell you about the city and you might realize how much people here love the city. Activities: Sightseeing, food tour, cycling, walking. Red Dragon 2 day 1 night cruise is the most popular choice, choosing this program you have less than 24 hours on cruise depending each cruise operators, plus 8 hours transfer to and from Halong Bay and Hanoi. The 2 day cruise let you experience kayaking, visiting cave or fishing village by bamboo boat, food served for dinner, lunch and breakfast. Whenever visiting any attraction in any country in the world, most travelers love spending their time exploring and enjoying local cuisines. Halong Bay tourists are probably no exception, and they would definitely be surprised by the exceptional gastronomy of this charming bay. 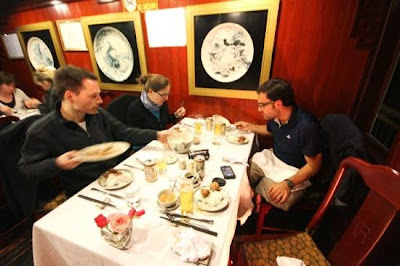 Joining trip with Red Dragon, you will have a chance to enjoy various tasty dishes everyday throughout your trip. Normally, there are about 5 to 7 courses each meal. Most of the dishes are frequently made of seafood. Halong Bay is proud for being not only one of New 7 Wonders of Nature of the world, but also one of the most famous destinations for high quality seafood. Thus, the menu on boat is really a dream of every seafood lover. Others courses are for non-seafood eaters with beef teriyaki, pork, beautifully marinated chickenand of course vegetables- all traditional Vietnamese. Our chefs always consider the balance of taste and health through foods.You will know this is totally no ordinary lunch when be served with a delightful cream of pumpkin soup for starter, followed by delicious fried oysters for main course. Then come the fresh seafood and amazing dishes, big juicy prawns, grilled monkfish in a sweet sauce, crispy fresh salad served with sesame seeds and sweet radish dressing, to name a few. If you have any special diet or any Western foods requirement, our staff will handle it carefully. Especially, if you are looking for a Halong Bay cruise offering vegetarian foods, Red Dragon is simply your perfect choice. Our professional chefs create not only high-quality but also extremely aesthetic foods. Every dish is truly an inspirational work of art which is made by skillful hands. You will totally admire them for making such incredible things. 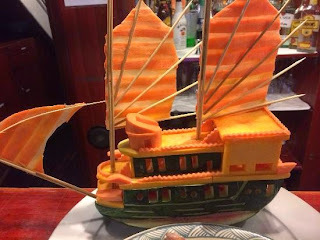 How about a lovely boat made from watermelon and pumpkins? How could it be better if your name is written on it? Or a stately dragon made from carrots. Don’t you think he looks amazing? Red Dragon is so delighted to bring you and your family a time of happiness. To serve our beloved customers better, this summer our new product – the Dragon Legend will be launched. This is a big ship with 24 cabins. Menu on the Dragon Legend is very flexible. You will be able to choose from a la carte meal, a set meal, and buffet. A plenty of Vietnamese traditional foods and international cooking styles appear in luxury restaurant here would satisfy even the pickiest tourist. The foods served on our boat have constantly been highly rated by visitors. Most of them consider the highlight of their trip was foods. Making her way through its fishing villages, caves, and dramatic shorelines, I explored this corner of Vietnam with a local, luxury cruise. Recently, Sapa Travel has promoted a package of 8 days and 7 nights in Northern Area of Vietnam. The travellers will have chances to overnight on our Red Dragon Junk Cruise. Bai Tu Long Bay occupies three quarters of Halong Bay World Heritage site and many islands in Van Don, Cam Pha district. Travelling to Bai Tu Long Bay is off the beaten track and promise to deliver many unique experiences, being far away from touristy sites. Luxury river expedition company, Pandaw has announced its new 10-night Halong Bay and the Red River sailing. The itinerary will commence in July 2015 and is bookable by travel agents with immediate effect via pandaw.com and cruiseshalong.com. The sailing will offer Pandaw guests the chance to explore the beautiful limestone islands in the iconic Halong Bay, before travelling to the remote upper Red River. Pandaw is the first river expedition operator to do so. Hanoi sprawls along the Red River (Song Hong), which is spanned by three bridges. The oldest is the 1682m (5500ft) Long Bien Bridge, built in 1902. Though bombed repeatedly by the US, the bridge supported rail and other traffic continuously throughout the war; today it serves pedestrians and non-motorised vehicles only. A few metres south is the newer Chuong Duong Bridge, and north of the city, servicing the airport, is the Thang Long Bridge. The capital's main train station, Ga Hang Co, provides access to the 2600km (1612mi) Vietnamese railway system, which runs up and down the coast between Hanoi and Saigon with links all over Vietnam and twice-weekly service to Beijing. Though sometimes even slower than the buses, these dilapidated trains are more comfortable as well as safer, for cross-country travel. Hanoi has recently transformed itself from a culinary klutz to an epicurean entrepreneur. Sophisticated restaurants, beautiful bars and chic cafes have begun to emerge around the city with increasingly international offerings. You can't go past the Vietnamese staple though, a steaming bowl of pho ; no traveller should leave without sampling this tasty soup or the other delicious street food. Like its restaurant scene, the city's bars are up and coming. The Bao Khanh area, west of Hoan Kiem Lake, has perhaps the best established scene, with locals as well as expats propping up the bars. Finish your night at one of the bars here after dining out or seeing a water puppets show, or if you like to boogie, have a few pre-party drinks before checking out the local clubs.